Friction is a force which always opposes the motion between two surfaces in contact. (1) When an object is in motion, friction will tend to slow it down. (2) When an object is at rest, friction will have to be overcome before it can start to move. (1) After opening the applet, choose Friction to start. 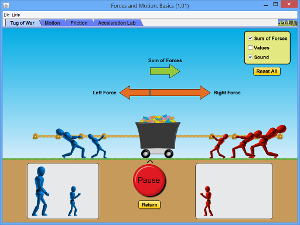 (3) Move the slider on Friction to the extreme left to have 0 frictional force. (4) Click the right arrowhead to increase the value of Applied Force acting on the box. You will see the box starts to move and speed keeps increasing from the speedometer. (5) Now, you gradually move the slider on Friction to the right. You will see that the box starts to slow down. You are done with first concept above. (6) Now, refresh the page by clicking the refresh button located below the Friction slider. (7) Again, select all the boxes on the top right corner to see the values. (8) Click the right arrowhead to increase the value of Applied Force acting on the box. When Applied Force is 50 N and 100 N, the friction force is also 50 N and 100 N respectively. However, when Applied force is 150 N, the friction force is 125 N and the box starts to move. This means the friction force between the surfaces in contact in the case is 125 N, that is why when applied force is 50 N or 100 N, the box does not move. But when the applied force is 150 N, it moves as 150 N is enough to overcome the friction force of 125N. You are done with second concept above. Note that when the applied force is not big enough to overcome the friction, the value of friction is equal to the applied force although the actual value of friction is bigger. However, when the applied force is big enough to overcome the friction, then the value of friction is the actual value of friction between the surfaces in contact. This can actually be observed from step 8 above. (a) When the applied force is 10 N, it does not move. Calculate the friction. (b) When the applied force is 40 N, it accelerates constantly with a value of 2 m/s^(2). Calculate the friction. How to minimize the friction?